As you might guess, there are numerous differences between old-time and bluegrass music, although they share a lot of similarities too. 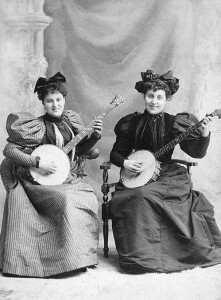 In old-time music, the banjo, fiddle and mandolin generally play the melody all at the same time. During an old-time tune, the guitar generally refrains from playing the melody and concentrates on providing the rhythm and an occasional bass run. In bluegrass music, on the other hand, only one instrument plays the melody at a time. Everyone else plays back-up. So let’s explore what playing back-up means in bluegrass music. First off, it’s good to remember that the only difference between music and noise is that music has rhythm and noise doesn’t. In bluegrass music, the most common rhythm is a one-two beat. Drawing on it’s African-American roots, the “two” is heavily accented, so the bluegrass rhythm is really more like “one-TWO, one-TWO.” Let’s try it. Tap your foot in a steady (not too fast) rhythm. Say “one” when your foot hits the floor and “two” when your foot comes up. Practice that a few times. BANJO. Most banjo players have a variety of back-up licks up their sleeve. Let’s go over two of them. For now, the fingers of your left hand can merely mute the strings so that you don’t have to be concerned with the chords. Tap your foot in a steady manner. When your foot hits the floor, play the 3rd string with your right thumb. As your foot comes up, pluck up at the same time on the 1st and 2nd strings. Your index finger will pluck up 2nd string and your middle finger will pluck up on the 1st string. The resulting sound will be “thumb-pluck, thumb-pluck.” I call this the “Earl Scruggs” because the rhythm sounds like “Earl Scruggs, Earl Scruggs.” Try it while you mute the strings with your left hand. 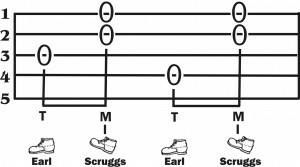 In addition to playing “Earl Scruggs, Earl Scruggs,” you can also just play what I call “Scruggs.” Here’s how to do it. Hit the 3rd string with your thumb at the same time you pluck up on the 2nd string with your index finger and the 1st string with your middle finger. The trick is that you’ll do this plucking motion only on the TWO. Let’s try it. Tap your foot. 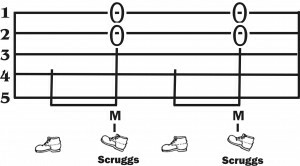 When your foot hits the floor, say out loud “one,” and when it comes up say “TWO.” Continue tapping your foot but only say “TWO.” So it’s “tap-TWO, tap-TWO.” You’ll play the “Scruggs” only on the TWO. FIDDLE, MANDOLIN & BANJO. So there you have it, friends. You fiddle, mandolin and banjo players are now equipped with the most fundamental techniques that will support the music, help keep the beat, and provide essential back-up without dimming the lights of the other musicians who are trying to shine. If you want to learn to play fiddle, mandolin or banjo, check out Wayne’s instruction books such as Bluegrass Mandolin for the Complete Ignoramus, Easy 2-Chord Songs for Mandolin (NEW! ), Old-Time Fiddle for the Complete Ignoramus, or Bluegrass Banjo for the Complete Ignoramus. A free catalog of Wayne’s complete collection of instruction and song books is available by calling (828) 299-7031, downloading our catalog online or by filling out a catalog request form. Everything I’ve tried from you so far has been helpful. I’ve been playing mandolin since January, and my son just started playing the banjo. My daughter has been dabbling with a guitar for a while. Who knows what noises will be raising our roof in a couple of years. Thank you again. Thanks, Kenny. Great to hear from you! I have 2 banjos and not very proficient of them, last year I purchased your Fiddlin Ignoramus book, I found it helped me greatly with playing my banjo…. I love your story books, had them in our home library long before I started playing a banjo. 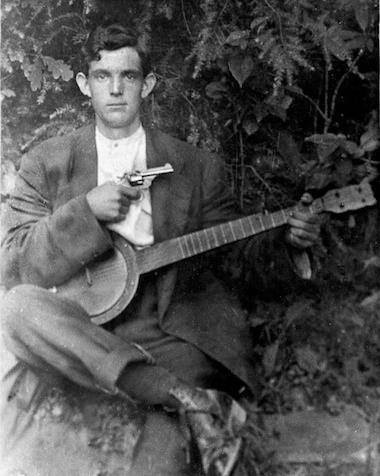 With your help I have improved myself on the banjo. If we ever get to Dulcimerville, we will look you up.